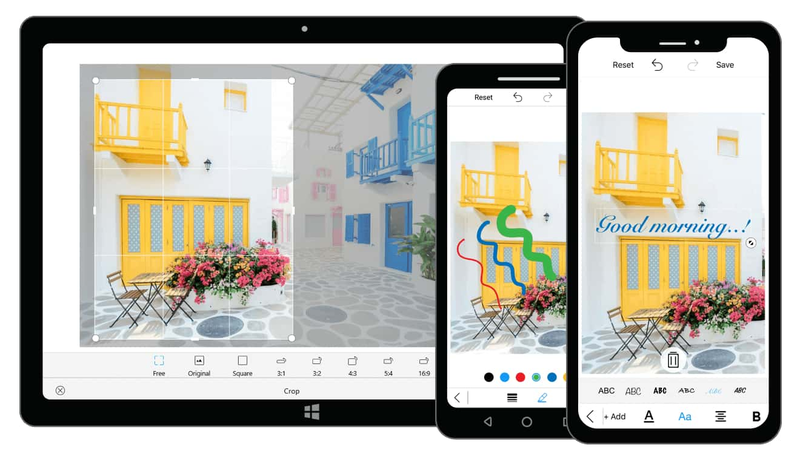 The Xamarin.Forms Image Editor component lets you easily modify images by performing actions like cropping, rotating, inserting text and shapes such as rectangles, circles, and arrows on top of an image, drawing free-hand, and much more. A pen tool in Xamarin.Forms Image Editor allows freehand drawing over an image. This feature also supports customizing stroke thickness, opacity, and the color of the pen. Annotate shapes like rectangles, circles, and arrows over an image. This feature also supports z-ordering shapes. Adding shapes to edit an image is widely used to mask an unwanted area or to point out a specific region in an image. Rectangles and circles can be customized by either filling the shape or drawing it as an outline. Shapes can also be resized. You can rotate and flip images with all edits intact. Image rotations are used to rotate any upside-down images taken with a camera and Flip an image to create a mirror image of the original image. Crop a particular region of an image to the desired size. There are many useful predefined aspect ratios available. Resize a cropped rectangle according to the aspect ratio. Edit an image by adding a text annotation to show useful information over an image. You can also make the text bold, change the font family, and align, italicize, or underline the text. Add any image over another image as an annotation to add more information. Resize and position the annotated image to any desired size and location. The Xamarin.Forms Image Editor supports save, reset, undo, and redo operations to enhance the editing experience. Save edited images in the desired format (i.e. .png, .jpg, and .bmp), n number of undo-redo operations for all editing actions and reset the image to the original form by discarding any editing changes done to an image. Customize the built-in toolbar by allowing the addition of any number of new toolbar items and the removal of existing items. This helps in performing custom actions. Zoom an image. The zoomed image can be panned smoothly to view a desired region. All features like text, shapes, freehand drawing, etc., are compatible with zooming and panning.